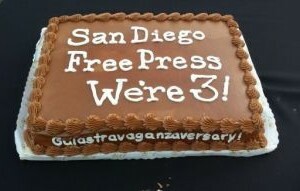 San Diego Free Press Celebrates! The San Diego Free Press celebrated its third birthday on August 8 with a Galastravaganzaversary party at Border X Brewing. Wow–three years! It has been an astoundingly active year for this unique all volunteer operated San Diego media presence. Contributors and editors have provided another year of progressive views with a distinctly grassroots perspective on the topics of labor, the environment, immigration, criminal justice, politics and government. Our approach–multi-media and multi-genre– reflects the talents and interests of our contributors. Video essays, personal narratives, cartoons and poetry are essential to the way that we present the people’s history. We take risks in terms of both the content provided and the format. The creative juices continue to flow; the vision of where we are headed is becoming more clearly delineated. Time for craft beer and a slice of galastravaganza cake! Border X Brewing generously hosted the event. It is a beautiful space. They now serve food as well as their craft beers. Thank you to David Favela and the wonderful staff. One of the entry ways into Border X has been transformed with the artwork of Joaquín “Junco” Canché. Junco had a solo show at Border X the previous week. He set up a table at the celebration to display more of his ‘toons. Junco is known to SDFP readers for his political cartoons which appear weekly. Quintento Caballero performed to an appreciative crowd outside on the sidewalk. Watermelon Man! El cuarto de Tula! Bill and his fellow musicos added some sabor to the summer afternoon. The speakers whom he introduced– Christian Ramirez of Alliance San Diego, Sarah Saez of the United Taxi Workers of San Diego and Franco Garcia of the Environmental Health Coalition, spoke about the challenges that working class people and the working poor face. Barrio Logan, where Border X is located, is a community where the need for livable wages, immigration relief and a healthy environment all intersect. One can make a similar case for City Heights, where Sarah Saez lives and works. Each speaker noted the importance of media coverage of issues affecting communities that are struggling to gain political clout and representation. Sarah Saez held up a sheaf of papers– copies of Doug Porter’s Starting Line—and thanked SDFP for its coverage of taxi drivers. The coverage has been extensive and sustained. We were sorry to hear that Council Member David Alvarez was unable to speak because of a family emergency and hope that all is well. SDFP received a certificate of recognition on behalf of Assembly woman Lorena Gonzalez. We are certain that it is the only certificate ever generated with the word “Galastravaganzaversary” in it. And then it was on to Freep Time! In the beginning, with Frank Gormlie SDFP editor Frank Gormlie was uniquely suited to providing a history of the alternative press in San Diego. Frank is The Editordude of our sister publication The OB Rag. The San Diego Free Press spun off from the OB Rag three years ago and we have remained connected ever since. Frank’s association with the San Diego Free Press extends back to the very first one (or maybe the second) back in the 60s, when the newly opened UCSD was a center of leftist political activism. Think Herbert Marcuse and Angela Davis… SDFP contributor John Lawrence was also involved at the time. Bud Sonka, who also worked on the original SDFP, brought a box filled with a complete first year run. Are you shocked to learn that the football stadium was a “super boondoggle” back then? It would be great if we can get that article scanned and converted for re-publication. Many thanks to Bud. There were a host of other alternative media publications and Frank was involved with most, if not all of them. There was The Door, which SDFP ed Doug Porter wrote for, and Frank’s publication The Whole Damn Pie Shop ( why would you settle for just one slice of pie?) and the Street Journal. SDFP‘s newest contributor Jeeni Ciscenzo hit the ground running with her weekly column My Niche. Jeeni is also a poet and read Checkmate to the crowd. The “We” that makes SDFP possible is you, the contributors. The collective day to day commitment and long range vision of the seven editors does not a media presence make. As we tell people so often, SDFP provides a platform, a canvas to reflect the thoughts and concerns of people who want a thriving progressive community. The new contributors this past year include much welcomed voices from Escondido and South Bay. Thank you all for coming out on that beautiful Saturday to celebrate. And we finished up the night with more music. We will add a photo gallery in the upcoming days. Lots of pictures, so check back. It was a great party. It has been a great year. Do I hear an “amen”? Nice photos, Anna, thanks for the coverage. Ya know, having the 3rd birthday for the Freep is important for OBceans, as it was the success of the OB Rag – I’m told – that inspired many of the non-OB writers for the Rag to set up the Free Press. And here it is – 3 years later – another success. Yea SD Free Press! Long may you hippie-types keep the spirit alive. Older Article: What Happened at the Foot of Cape May Last Week? Was It Sexual Assault or Just 2 Drunken Friends?